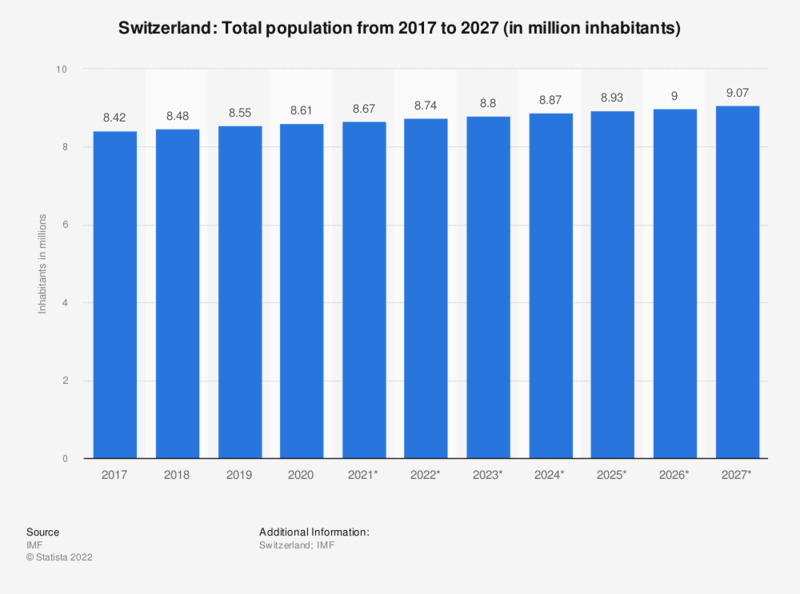 The statistic shows the total population of Switzerland from 2012 to 2017, with projections up until 2022. In 2017, the total population of Switzerland amounted to around 8.42 million people. See the figures for the population of Italy for comparison. Switzerland maintains one of the most stable economies and has been revered as the most secure banking and investment safe haven in the world. The country is viewed as not only one of the most economically advanced countries, but also one of the most politically respected countries, primarily due to having exceptionally good relations with the majority of countries around the world. Despite being affected by recessions in the early and late 2000s, Switzerland sustained a sufficient economy through competent leadership, most notably when considering the amount of money the government spent in comparison to the amount of revenues earned from goods and services. Many countries around the world suffered economically due to overspending, which often indirectly led to higher unemployment rates. However, Switzerland sustained a relatively balanced and low unemployment rate through the years through adequate government spending as well as a high percentage of skilled workers occupying the country’s workforce. A strong economy, beautiful nature and overall distinctive cultures have made Switzerland one of the most visited tourist countries in the world. Additionally, Switzerland is also a relatively popular country to visit for business meetings due to its centralized location and well renowned reputation.